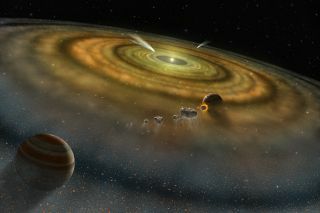 Artist’s conception of the view towards the young star Beta Pictoris from the outer edge of its disk. This disk of dust and gas orbiting the star is produced by collisions between and evaporation of asteroids and comets. The star is about 63 light-years from Earth. Comets detected around other stars appear strikingly similar to the most primitive comets in the solar system, researchers say. The discovery suggests that matter around distant stars mixed in ways similar to the solar system in its youth, scientists added. Astronomers have detected thousands of alien planets orbiting distant stars. In addition to these exoplanets, scientists have begun discovering vast clouds of extrasolar comets, including balls of ice and rock that may be pelting these far-off worlds. Researchers think massive numbers of comets bombarded Earth billions of years ago, delivering not only the water that now makesup the oceans,but potentially the organic ingredients of life. To learn more about alien comets, astronomers focused on the Beta Pictoris system, about 63 light-years from Earth. Beta Pictoris is a young (12 million years old) analog of the solar system: Its star has a disk of debris around it full of small grains of dust, and at least one planet relatively close it, about 10 times the distance from the Earth to the sun (10 astronomical units, or roughly 930 million miles – 1.5 billion kilometers). The scientists used the European Space Agency's Herschel Space Observatory to scan Beta Pictoris. Materials around a star absorb some of its light, resulting in patterns known as spectra that allow scientists to identify what the materials are. The researchers looked for signs of olivine crystals around Beta Pictoris. This olive-green crystal is typically magnesium-rich when it first forms in space, as is seen in the most ancient comets in the solar system, unlike the more iron-rich olivine seen in asteroids. In the cold outskirts of Beta Pictoris, about 15 to 45 astronomical units from the star, the Herschel spectra revealed that the olivine is rich in magnesium. In addition, these crystals comprise about 3.6 percent of the dust around Beta Pictoris, making the dust strikingly similar in composition to the most primitive comets in the solar system, such as 17P/Holmes and 73P/Schwassmann–Wachmann, which are about 2 percent to 10 percent crystalline olivine. "I find it stunning that we were able to detect the spectral fingerprint of this material in another planetary system," said lead study author Bernard Lammert de Vries, an astrophysicist at KU Leuven University in Belgium. "The dusty disks in these systems are very faint." Olivine crystals in space can form only within 10 astronomical units of stars. The fact that comets are typically seen much farther out suggests this material is regularly slung away from stars. The similar levels of crystalline olivine seen in Beta Pictoris' dust and the solar system's ancient comets suggest that matter around these stars may have mixed in similar ways, even though Beta Pictoris is 1.5 times more massive than the sun and eight times brighter. "This is a step towards a better understanding of planet and star formation," de Vries told SPACE.com. The scientists detail their findings in the Oct. 5 issue of the journal Nature.